As contemporary life is more and more reliant on non-stop streams of information from our mobile devices, and constant stimulation becomes the norm, people crave a way to unplug and give their minds a rest. Meditation offers one way to do this. If you've been feeling like you'd like to try meditation but you're not sure how ​then here's one basic method to get you started. For our purposes, let's define meditation as being attentive to the fluctuations of your mind. Most of the time, we completely identify with our own thoughts, meaning there is no separation between the thoughts and the thinker. Meditation begins to break down this relationship. There are many different schools of meditation, each with its own methodology. The technique of observing your breath described below is based on a Buddhist tradition. Many people like to meditate first thing in the morning, but if some other time of day is better for you, go with that. Just make sure you pick a time when you can consistently devote yourself to this practice. It doesn't have to be lengthy. Ten or fifteen minutes is a good place to start. 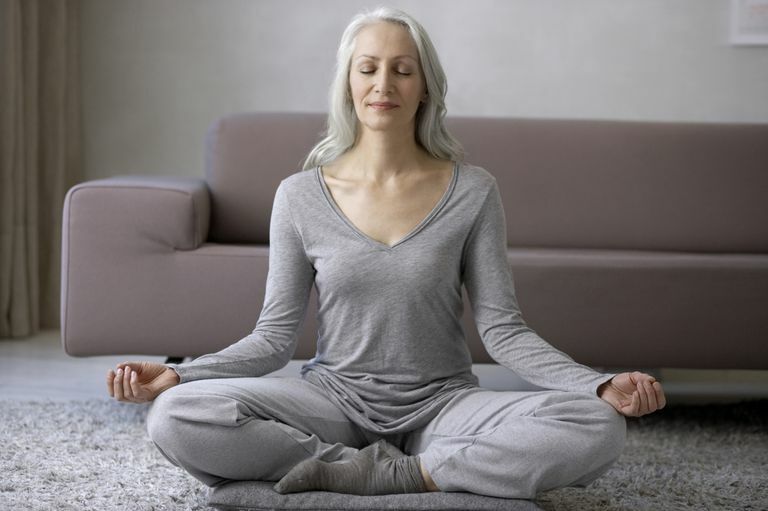 If you have a regular yoga routine at home, you can do your meditation at the end. In addition to choosing a time, you also need to find a place for your practice. It doesn't have to be big or have any kind of special decor, but it should be away from household distractions. A corner of your bedroom or living room is perfect. You'll also need a timer that will sound at the end of your meditation session so that you're not constantly checking the clock to see how much time is left. Silence your phone so that you're not tempted to break off your meditation if it rings. You may want to do a little warm-up yoga sequence before sitting, especially if you are going to meditate first thing in the morning. If you find you don't need to warm up, that's fine too. If you can sit on the floor, have blankets or a cushion to sit on. Meditation cushions called zafus are nice, but definitely not necessary. Try a cross-legged position like sukasana. Most people can not sit for long periods in the lotus position and can even injure themselves trying, so avoid that for now. If cross-legged isn't comfortable, try virasana with a block under your seat. It is often an easier position for your back. If you can't sit on the floor, that's fine too. Find a chair where you can sit up straight with both your feet resting flat on the floor. You may have seen pictures of people meditating with their hands in various positions called mudras. You can try any position you have seen, but you can also just place your hands in your lap. Another option is to place the hands on your knees with the palms up or down. Find a position that is comfortable for you. Assume your seat and close your eyes. Begin to observe your breath without changing it. There is a tendency to want to deepen your breathing as soon as you notice it. Resist this urge. Focus all your attention on your inhales and exhales, maybe zeroing in on the sensation of air moving in and out of your nostrils. You can count the breaths if that helps you stay focused on them. When your mind starts to wander, as it inevitably will, notice your thoughts and then release them. You can even picture them floating away before returning your attention to your breathing. When you first start, set your timer for five minutes. If it's hard for you to stay attentive to the breath for that length of time, work on that before increasing the duration. When you are ready, begin to add one minute to your sitting time. Slowly work up to ten and then twenty minutes. When your timer sounds, open your eyes. Take just a few moments to notice how you feel after your practice. If you are stiff after sitting, slowly move to your hands and knees. A little stretch (a downward-facing dog, for instance) can help you loosen up. Mindfulness Meditation - How Do I Do It?